Having missed the first four competitions of the SWSA winter league events, I was really looking forward to attending the last event. The journey from London looked promising too, with bright sunshine all the way to the T junction at the Bwlch. Unfortunately, the wind couldn't make its mind between the Ice Cream slope and Mickeys. The latter was deemed the least worst option, so it was out with the gear, and onwards to the slope. We managed three rounds before the wind swung further West and it became clear that we couldn't continue. Despite the lack of rounds, it was a lot of fun, with a relaxed atmosphere, and the tricky conditions made for some useful practice. Afterwards, the two Martins, Graeme Mahoney, Dave Rumble and myself drove up to Mickeys. 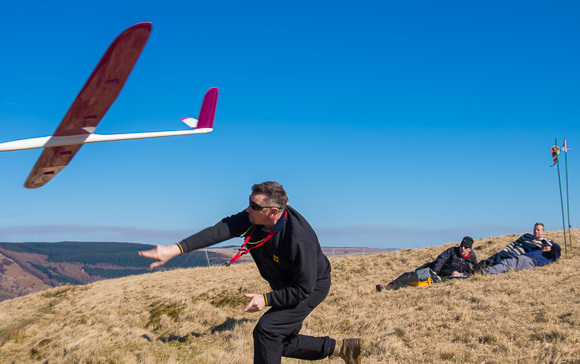 By this time the wind had swung further round in our favour, and the combination of thermal and slope lift made for some great sport flying. Martin Drewitt is getting on well with his Baudis Pitbull, a sweet handling machine with a great turn of speed. Graeme Mahoney brought along his Futaba MZ18 - a classy piece of kit with integrated telemetry, touch screen, great graphics, and some clever flourishes like knobs which retract flush, and which retain their settings. There's so much variety in RC gear these days it's difficult to keep up, so it's always good to see what other pilots are using. Meanwhile I used my FrSky Taranis to good effect. Our ever helpful Martin Newnham gave us some tips on EM setup, and we'll in no doubt be tweaking our snapflap setups as a result! A special word of thanks goes to our host and CD Andrzej Tabero who manfully overcame a painful back to keep the show going.